Mark your calendars and prep your tastebuds because the 2018 Taste of Mount Veeder walk-around wine tasting is just a few weeks away, between 1 and 4 pm on Saturday, August 4th. You shouldn’t miss out on this opportunity to taste and enjoy wines from 25 Mount Veeder wineries, including several that aren’t normally open to the public, all conveniently gathered together for you at The Hess Collection (4411 Redwood Road, Napa). Now in its 19th year, the Taste of Mount Veeder will showcase the amazing wines from this appellation accompanied by small bites from the Hess Collection culinary team, live music from The Hummingbirdz and a Silent Auction. General Admission is going to be $150 per person at the door but if you move quickly you may still be able to purchase Special Advance Tickets for $125 each. For more details, and to purchase tickets, please go here. On the southwestern side of Napa Valley, Mount Veeder is an appellation where richly intense, age-worthy wines have been produced since the 1860’s. The white wines made from grapes grown here display luscious stone fruit, hints of citrus, and herbal aromas and flavors. Mount Veeder red wines typically exhibit dark fruit flavors of blackberry or raspberry, sweet herbal notes and deep stony minerality with forest flora aromatics. You may already be aware of how excellent the Chardonnays and Cabernet Sauvignons are from this region, but this Tasting can help you discover outstanding premium wines crafted from other varietals such as Pinot Gris, Monteuse and Malbec. 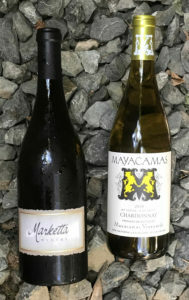 Last year, our favorite Chardonnays at the Taste of Mount Veeder were from Fontanella Family Winery, Marketta Winery, and Mayacamas. 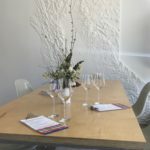 We were also impressed by a Pinot Gris wine from Hess Collection, a “Trinity Blanc” blend of Marsanne, Roussanne and Viognier from Progeny, and the Rosé (of Syrah) from Lagier Meredith. 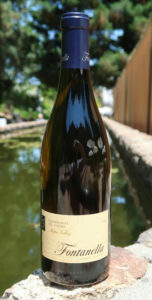 In other years, our favorite white wines have included Chardonnay from Godspeed Vineyards and Albariño from Hess Collection. So, if you attend this year’s event, those are just some of the wines we suggest you seek out. Of course, Mount Veeder is even more famous for its Cabernet Sauvignon wines, and the ones we personally enjoyed the most last year were from Marketta Winery, Pilcrow, Random Ridge, Robert Craig Winery and Y. Rousseau Wines. The other red wines of note for us at the 2017 Taste of Mount Veeder were the Mondeuse and Malbec from Lagier Meredith, the Merlot from Marketta Winery, and the Malbec from Rubissow Wines. In prior years, we’ve also been enamored with the Tribidrag from Lagier Meredith, Cabernet Franc from Mount Veeder Winery and Yates Family Vineyard, and Cabernet Sauvignon from Fontanella Family Winery and Rubissow Wines. 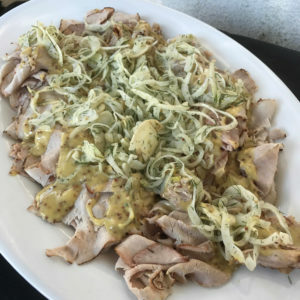 In addition to the great wine, a major feature of the Taste of Mount Veeder is the food, prepared by Hess Collection Executive Chef Chad Hendrickson and his team for attendees to enjoy between sips. Last year, guests’ choices included Charcuterie, Nuts, Cheeses, and Goat Cheese Puffs. Other tasty morsels served up around the tasting venue were Grilled Black Mission Figs with Balsamic Syrup, Roasted Eggplant Tomato Crostini, Niman Ranch Pork Loin with Pickled Shaved Fennel, and Dobosh Tart. As you can probably tell, we encourage people to attend this event because we always find wines to love and recommend at each year’s tasting. In addition to the wineries mentioned above, other participants at this year’s event (which may be pouring wines you’ll fall in love with) should include Angelo Cellars, Brandlin, Mithra Winery, Mt. Brave, O’Shaughnessy Estate Winery, Paratus Vineyards, Rudd, VGS Chateau Potelle, and Vinoce. 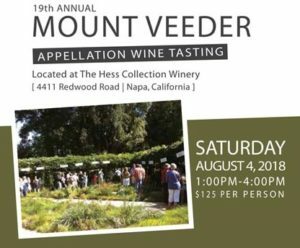 The Taste of Mount Veeder is presented by the Mount Veeder Appellation Council. This appellation covers about 16,000 square miles within the Mayacamas mountain range that separates Napa and Sonoma Counties. Mount Veeder is one of the five mountain appellations in Napa Valley and is the “coolest” mountain as the SF Bay breezes cool the region, resulting in a Bordeaux-like climate. Due to the scarcity of plantable sites on Mount Veeder, only about 1,000 acres out of 25 square miles are planted to grapes. Yields on the mountain vineyards are exceptionally low (about half the Napa Valley average) which helps produce richly intense and age-worthy wines in this appellation. Once again, for more details about the 2018 Taste of Mount Veeder event and/or to purchase tickets, please go here.